Work on creating a multi-use community hub for west Reading is due to get under way from the beginning of May. There are exciting plans to improve and transform Battle Library this year, so that more people can enjoy what it has to offer. The library will be closed from Friday 19th April for building work to take place, re-opening again in late summer 2019 (although it will open for one day as a polling station on 2nd May). Books can be returned to library staff between 9am to 12pm on Fridays in the Emmanuel Methodist Church next door to the library. A small selection of books will be available for loan at these sessions, and requested items can be collected. Rhymetimes will also take place at the Emmanuel Methodist Church on Fridays at 10am and 11.15am. child health clinics and Children’s Centre activities be accessed at Central Library on a Wednesday. Library cards can be used and books returned to any other Reading library. After it re-opens, Battle Library will continue to offer all of its popular library services, as well as Children’s Centre activities, adult learning, and community activities. 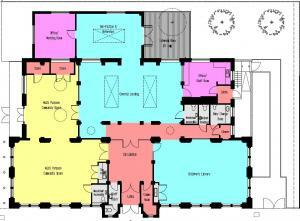 The major building and alteration works will create a new rear extension and reorganisation of the space. This will provide a new flexible community space when the library re-opens in late summer. The space will be available for community groups to use outside of library opening hours. There will also be a kitchenette and an outside deck area. Changes have been carefully designed to respect and preserve the character of this beautiful community building, including the murals in the much-loved children’s library. 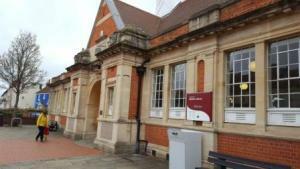 Follow the library service on social media @ReadingLibrary and Facebook @ReadingLibraries for the latest updates.